When you want to change up your look without spending a fortune, focusing on small changes can have a big impact. Whether that’s chopping your bangs, adding a piece of statement jewelry to your wardrobe, or buying a new lipstick, giving yourself permission to refresh your style is a fun and affordable way to keep things interesting. 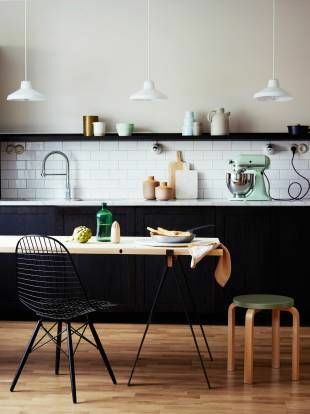 As a homeowner, there will almost always be things you wish you could change about your house – the kitchen in particular. Perhaps it’s the dated appliances and the color of the countertops. Or maybe you wish there were more natural light and a breakfast nook where you could enjoy your morning coffee. While these changes are possible, a major kitchen remodel can cost as much as $60,000. Not exactly pocket change. Luckily, it doesn’t take an army of contractors and thousands of dollars to give your kitchen the facelift it needs. Refinishing your cabinets can be a budget-friendly alternative to an expensive and time-consuming overhaul of your existing style. Better yet, it’s something you can do yourself in just a few hours. With a little bit of TLC and a gallon of paint, you’ll fall in love with your kitchen all over again. Here are a few tips to get your project off on the right foot. 1. Though they may all look the same in the store, buy the best brush you can afford. The difference in brush strokes and the quality of the finished product will amaze you. 2. When you remove the cabinet doors be sure to label or number them so you put them back in the right place. Take care not to sand off or paint over the marks. 4. Clean the cabinets thoroughly to remove heavy grease deposits that could interfere with the refinishing. Trisodium Phosphate does the job nicely. 5. 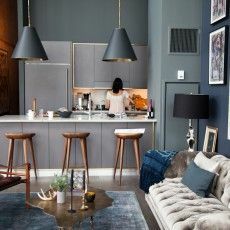 If you’re going for a darker look, there’s no need to sand all the way down to the bare wood. Simply work on getting the shiny polyurethane coating off. 6. If you plan to use paint to refinish your cabinets you’ll need prime them first. Ask the professionals at your home improvement store what kind of primer they recommend. 7. 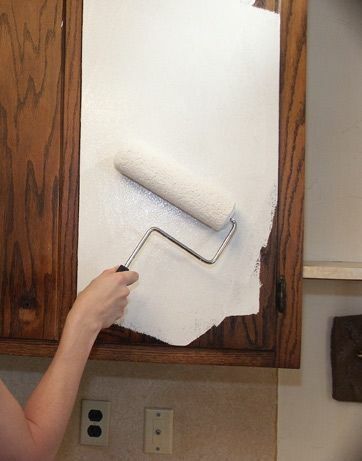 Apply two to three coats of paint or stain until you reach your desired shade. Always brush in one direction and don’t lay it on too thick. 8. Once the paint or stain has dried fully, simply reinstall your hardware or install new knobs and handles (Anthropologie has a great selection) and re-hang the cabinets.